Comparing philosophies it is clear creationism is the winner. Materialism validates facts, the existence of a material thing is a factual issue. That leaves opinion, like opinion on beauty, outside of materialism. So then they devised postmodernism which asserts that subjectivity is inherent in statements of fact. That doesn't make much sense. The best thing ofcourse is to accept the validity of both fact and opinion, each in their own right. That is creationism. With the two domains of creator and creation, opinion is validated in respect to a creator, and fact is validated in respect to a creation. Where choice is the mechanism of creation, defined as making one of alternative futures the present. A fact is obtained by evidence of a creation forcing to produce a 1 to 1 corresponding model of it in the mind. An opinion is formed by making a choice about what it is that makes a choice. If I leave my bread in the toaster too long it burns. Fact. Doesn't your toaster have a timer on it? Seems you have an unsafe toaster. Welcome back with your familiar old subject matter Syamsu. Nice graphic. Over 6 years ago. Can you believe that? Where does the time go, eh? I am not sure what’s worse. Someone being staunchly postmodernist or not knowing they are being staunchly postmodernist? Syamsu, I think you’re doing the later. Calling this PM is an insult. This is just empty words. When on shaky ground try to show false statements with a graphic. Better a faulty toaster, than a brain without a tap to halt the verbal diarrhoea. Syamsu. Regarding the potentially unsafe toaster. Imagine it was your toaster. What would you do to prove to yourself if it was working properly or not? The OP seems to me a jumble category errors. 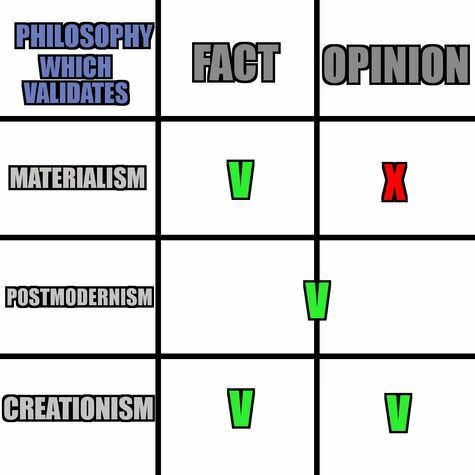 I don't see Creationism as of the same type of position as postmodernism or materialsm. In fact I am not sure those two are the same type of category. I think one could be a post-modern materialist. Someone like Deleuze. One can explain beauty via Materialism. One could have a theistic materialism, iow with a creation event, but a non-trnscendent deity. Creationism if demonstrated might give AN explanation of beauty or it might not. But then it's not demonstrated, so this is hypothetical. The OP seems so jumbled with missing arguments, category errors and false dichotomies it's hard to even argue against because there is nowhere to get a handhold. Note: Syamsu does not use the term "creationism" in quite the way you might normally be used to hearing it used. To get a sense of the way in which he has used it, while making this same single point over the last 6 or 7 years, click on his name, click "Search user's posts" and then search for the term "creationism", starting with the OP of the topic to which I linked above. That topic was started 6 years ago and is the same, essentially, as this one.